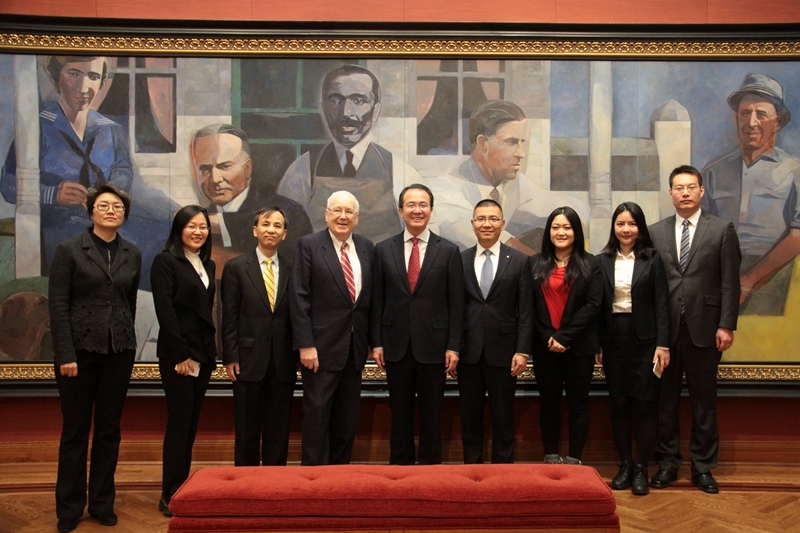 On January 5, Consul General Hong Lei met with Ambassador Ken Quinn, President of the World Food Prize Foundation at the World Food Prize Hall of Laureates located in Des Moines, IA. Ambassador Quinn extended his warm greetings to Consul General Hong Lei and gave a detailed introduction of the background and laureates of the World Food Prize, and also happily recalled the memorable experiences hosting Comrade Xi Zhongxun and President Xi Jinping in 1980 and 2012 respectively. Ambassador Quinn said he participated in many agricultural collaborations between U.S. and China. Over the past 30 years, China's agricultural development has achieved great success and made a great contribution to solving the world’s food problem and promoting cause of poverty alleviation. He wishes to see more Chinese recipients of the World Food Prize in the future. Consul General Hong Lei expressed appreciation for the positive contributions of the World Food Foundation and Ambassador Quinn to promoting the world agricultural cooperation and addressing food security issue. He said that China and the United States have carried out effective cooperation in the agricultural field. China and the state of Iowa, the major agricultural state of the United States, have also achieved fruitful cooperation in agriculture. We look forward to working with the World Food Prize Foundation and Ambassador Quinn to push forward agricultural cooperation between China and the United States to a new level. The World Food Prize is the global highest honor in the field of agriculture, founded by the Nobel Peace Prize winner Dr. Norman Borlaug in 1986, awarded annually by the World Food Prize Foundation recognizing people who have made significant contributions to improving the world's food supply. He Kang, former Chinese Minister of Agriculture and Yuan Longping, the father of hybrid rice, won the award in 1993 and 2004 respectively. Deputy Consul General Liu Jun attended the meeting.